evangelizing the (digital) natives : Should We Have Math 7th Hour? Should We Have Math 7th Hour? I have 3 Algebra Strategies classes this semester - 2 in the morning and 1 in our last class of the school day. These classes' assignments are all differentiated according to students' skill levels and all the exercises are individually generated using Renaissance Learning's Accelerated Math. I love doing these classes because I get a ton of time to work individually with students and its a fantastic opportunity for students to catch or get ahead in their math skills if they take advantage of it. Because everything is differentiated and individualized, I've seen students' growth have a correlation to their capacity to monitor their own on-task behavior and persevere through assignments. I'm sure I don't have to tell any educator this, but the last hour of the day is difficult for students' attention in any course. That physical need to blow off steam and relax after a long day of sitting in chairs is not a recipe for success in a program that requires that self-monitored attention. 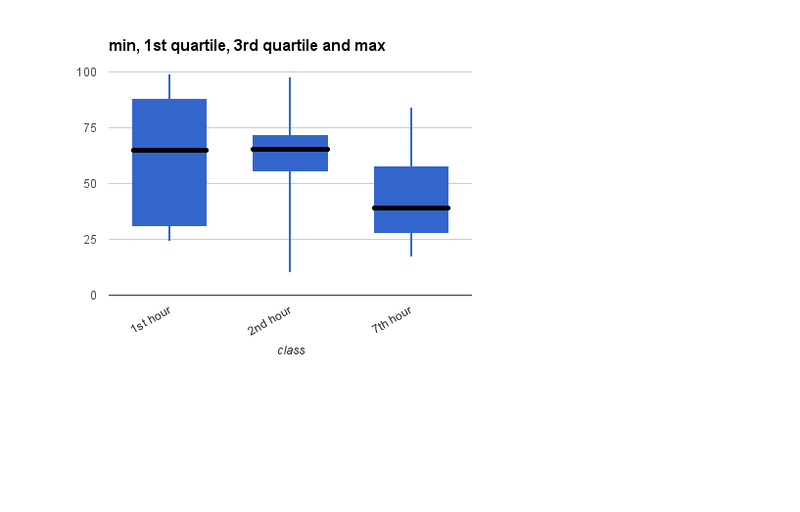 Take a look at these box plots from my 3 classes measuring the spread of the students' "student growth percentile," a metric Renaissance Learning includes in their reports of student performance on their benchmark "STAR" tests that measures a student's age AND prior performance against a peer group. According to training material from Renaissance Learning, "ideal, typical growth" for a student will be anywhere between 35 and 75 percentile SGP. My first two classes' median SGP are at the top of that range! Then inexplicably, a similar student population using the exact same program in my 7th hour has a median SGP of 38. Could there be anything else at play here besides the 7th hour effect? Is "Makerspace" Another Learning Silo?